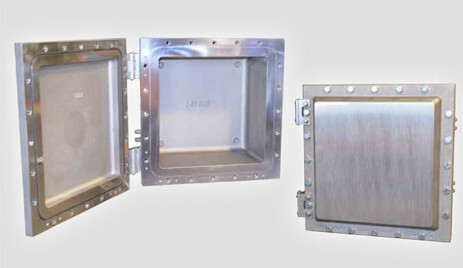 Crouse Hinds ECP Series Explosionproof Enclosures feature optimized design, extensive sizes and fast lead times for OEMs. ECP Enclosures are available in 40 standard sizes with optional conduit and device drilling and tapping. Aluminum hinges standard on sizes 121204 and larger, and available on sizes 081006 through 101406 by adding S598. Stainless cover bolts and hinges are available by adding S391. Stroke-sanding creates smooth surface for installation of push button / pilot light operators. Optional epoxy coat finish available for NEMA 4X requirements. Factory drilled and tapped, internal mounting pads enable the installer to add a mounting plate in the field. Allows for easy fieldreplacement in case mounting feet are damaged or broken. Comes standard in all sizes. Provides NEMA 4 rating for enclosure. Download the Crouse Hinds ECP Series Explosionproof Enclosures spec sheet below or call 714.835.6211 for more information.